The above info came from Taii, and was edited by yours truly (contact me). The image came from One Piece - Dream Soccer King. Tony Tony Chopper was born with a blue nose so his family and herd rejected him. He then ate the Human-Human fruit (Hito-Hito in Japanese) and became even more isolated from the other reindeer. He tried to communicate with the humans of Drum Island (a land of snow) but they shot him, thinking he was the Abominable Snowman. Then a doctor by the name of Dr. Hiriluk, who praised pirates and desired to join a crew himself, took him in. But Hiriluk then became sick and cast Chopper out into the cold not wanting the reindeer to watch him die. When Chopper found out, though, he set off on a journey to find a cure. He saw in a book a mushroom with the skull and crossbones sign next to it. Not realizing what the symbol really meant because of Hiriluk's praising of pirates, he set off to find it. Doctor Hiriluk was overwhelmed with joy when Chopper brought back the mushroom despite numerous injuries he had acquired (Like a broken horn). He ate the mushroom to please Chopper, knowing that it was actually a deadly poison (just to show his love). Rather than die from the mushroom's poison, for Chopper's sake, he committed suicide outside Drum Island's castle when King Wapol fled. As his last will, Dr. Kureha, the only doctor who wasn't owned by King Wapol's government, was to take charge of Chopper. She taught him everything she knew about medicine. They lived an isolated life in Drum Castle until Luffy and his crew came along. Chopper had already been naturally distrustful of humans and Sanji and Luffy's shared desire to cook and eat him didn't help. But, impressed by his medical and fighting skills displayed against Wapol's returned army, Luffy decided to put all differences aside and asked (forced) Chopper to join his crew. So Chopper became the crew's doctor (though at the time, Luffy didn't know Chopper was a doctor). 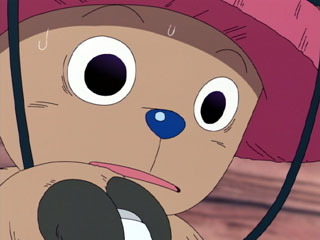 Chopper is a unique character in that he can change form after eating the cursed Hito Hito Fruit. 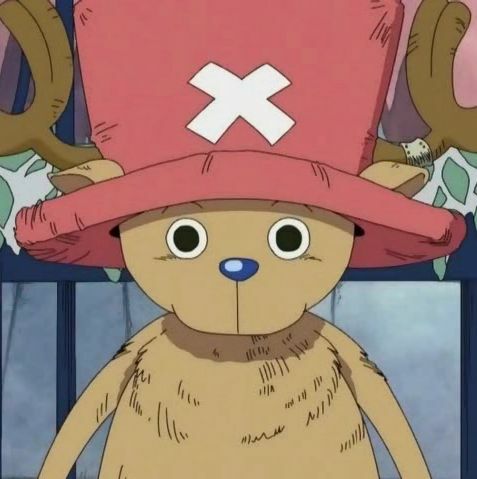 But this also deepens his value, because the berry also turns Chopper's nose blue and he is able to change form to reindeer, reindeer-human (the general form), and a muscular manly deer (the monster). Because of this, he was kicked off his reindeer herd, where his old friend Doctor Hiluluku finds and helps him for one year. But in the Dolamu Land of Snow, Dr. Hiluluku catches a illness that can only be cured by a special mushroom. Chopper goes on a journey for the mushroom and mistakes a poisonous mushroom for the antidote, which Dr. Hiluluku eats for Chopper's sake and dies. Chopper was born on Yagi Island. The above description came from Mpumi and Taii, and was edited by yours truly (contact me).